It’s so easy to get caught up in the hype. Someone mentions a new serum or skin treatment in a Facebook group or a blog post. Next thing I know I have a box at my doorstep with another jar or bottle for my medicine cabinet. For weeks I’ll apply the product expecting miracles. And maybe it will do good, but often it’s nothing that is life-changing. When the bottle runs out or my skin reacts negatively, I go back to what I was using before… and wonder why I tried switching in the first place. Hence this Colleen Rothschild retinol review post. All year long I’ve been trying different things to help with wrinkles and uneven skin. I went big in February with Botox, which gave me Botox-induced ptosis and I walked around for two months looking like Forest Whittaker. I tried an expensive dermatologist-prescribed line which made my skin look utterly amazing… until two months in when I acquired an allergic reaction and had a rash from hairline to chest. I tried multiple highly-rated products from a very popular infomercial-turned Sephora darling brand and all looked great for a week or two then gave me deep slow-moving pimples on my chin and around my mouth that takes a month to finally come to the surface and another month to disappear. Nice smelling products that made me break out, chemical-smelling products that shockingly burned my skin, sensitive products that smelled like nothing and did nothing. And now it’s the end of the year and I’m back to my reliable favorites I’ve used off and on for years. I can't help but wonder why I keep switching. This is a love letter to Colleen Rothschild skincare, specifically her Retinol Supreme Night Oil. That glass bottle of pink liquid, so elegant on the shelf of my medicine cabinet, so unassuming, but so effective. Dear Retinol Supreme Night Oil, will you forgive me for straying? Each time I am burned (figuratively but also sometimes literally) by another product, you take me back, heal me, make me feel new. While some retinol products leave my skin dry or irritated, you soothe and hydrate while also making my skin look softer and smoother. With just two pumps you turn my face and neck into silk. You don’t fight with other products, you don’t need a fancy routine of layers and waiting to soak in. I can massage you into my skin and immediately put night cream over you and you don’t get angry or lash out with redness or sensitivity or get passive-aggressive with ineffectiveness. Summer or winter, you’re there for me, gently improving my skin. And dear Retinol Oil, you have great friends. Any time you invite them into the medicine cabinet, we always have a great time. I met you through Colleen Rothschild Radiant Cleansing Balm, a friend for several years who has never betrayed me and only brings clean and happy skin to the relationship. Sheer Renewal Cream smells amazing, hydrates without being greasy, and is also one I keep coming back to after being burned by other products. Extreme Recovery Cream may have been ignored during the hot and sweaty months of summer, but now that the temps have dropped she’s returned to the front of the medicine cabinet to wear with you at night and sometimes be applied mid-day when feeling dry. Beauty Water is my favorite travel companion. I mist my skin mid-flight and re-mist when I get to the airport. I use it to refresh my makeup after a long day, and it's the last thing I apply to my skin before I go to sleep. 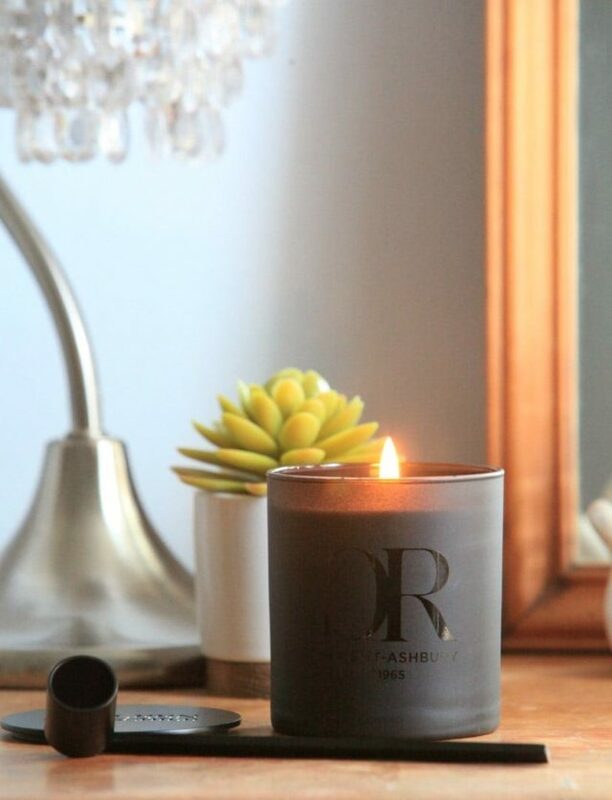 Even your friend, the Haight-Ashbury Candle scents my bedroom and journeys with me to make hotel rooms feel more like home. I’ve taken you for granted, but this winter I plan to be loyal. When I stick with you and your friends, I don’t get raw, red skin under my nose, dry cheeks, or crepey skin around my eyes. I don’t have to think, or plan, or strategize. I can do my evening skincare routine so quickly, and go to sleep knowing my skin is cared for by old friends. Thank you Retinol Supreme Night Oil for sticking with me even when I strayed. FYI, use promo code OXYGEN20 and get 20% off your order! Disclosure: I receive free product from Colleen Rothschild, but wrote this post and continue to use the products because I truly am a mega fangirl. I just discovered your blog and I love it, especially your Thanksgiving post. Do you use the retinol oil with any other products? Right now I use a vitamin C serum, a hyralonic acid (sp?) serum and a ROC retinol cream. Sometimes a sheet mask to sleep in, sometimes a night cream. Is the oil supposed to simplify the routine and negate a multi step process? At night I do the retinol oil, eye cream, a night cream, and then a hydrating oil (no chemicals or acids) to seal it all in. In the morning I use a glycolic acid toner to wipe my face, apply Vitamin C before going to the gym (heard it penetrates better when you sweat). After my post-gym shower, I apply just sunscreen and moisturizers, no treatments (though occasionally hyaluronic acid since that only helps with moisture). Thanks for your routine spelled out-I don’t even think I have any oils without acids in them but I will look into tweaking my evening plan. I currently use Vitamin C serum at night and in the SM… perhaps it’s worked it’s charm with my night sweats! I am a woman of color, and I can tell you for a fact that Colleen Rothschild is the very best!! I have all the products you mentioned except for the cleansing balm, and I am now going to order that! The retinol oil gives my face life! !She truly makes amazing products. I’m so glad to hear you love it as well! And the cleansing balm is amazing you’ll love it! I bow down to retinol oil! !